We are combining the two for a Sunday afternoon filled with fun, education, self-care and community! 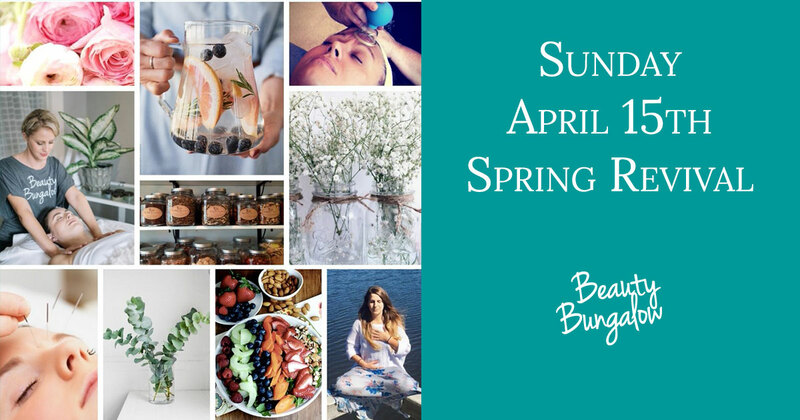 The Beauty Bungalow is teaming up with Thank You Mama Wellness Center for a wellness event inspired by the concept of Spring Renewal, empowering you to live your best, most beautiful life! Get tickets to reserve your space for Spring Revival: Awakening Beauty! We only have 25 spaces and this one will fill up fast! Space is limited to 25 guests. Get tickets to reserve your space. Recline and enjoy a skin firming and lifting gua sha face massage by The Beauty Bungalow using eastern facial rejuvenation techniques and raw organic Laurel Skincare. This line will brighten and nourish skin from the outside in… It’s pure plant medicine. Slow down and allow one of the Thank You Mama massage experts to relieve your back tension and melt away stress with a customized seated chair massage. This boosts overall circulation and engages your “rest and digest” nervous system. In addition to self-care services, we will host LIVE demos of facial cupping, facial Acupuncture Injection Therapy, Mei Zen cosmetic Acupuncture and facial Gua sha with Thai herbal poultice massage. This is an amazing way to learn more about traditional ancient techniques that support overall wellness and gorgeous, glowing skin. We’ll answer your questions in a safe space, demonstrate the techniques, and explain in depth the benefits of each. If you’re seeking holistic answers to your beauty needs, this is the place for you. We’ll close the afternoon with a soothing sound therapy session and guests will leave with a custom handmade bath tea to keep the intention of self love and care going at home. Use the full price ($25) of your ticket toward ANY service with the Beauty Bungalow or Thank You Mama when you book your service at the event! First ten guests to purchase a ticket have the opportunity to opt-in for a chance to be a model for one of the live demos.